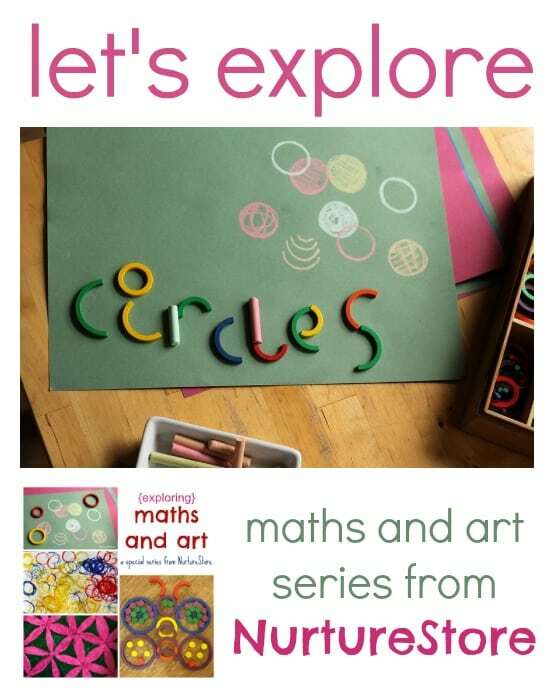 Welcome to a new series on NurtureStore where we’re going to be exploring maths and art, learning more about each by learning about them together. Today we’re all about circles. 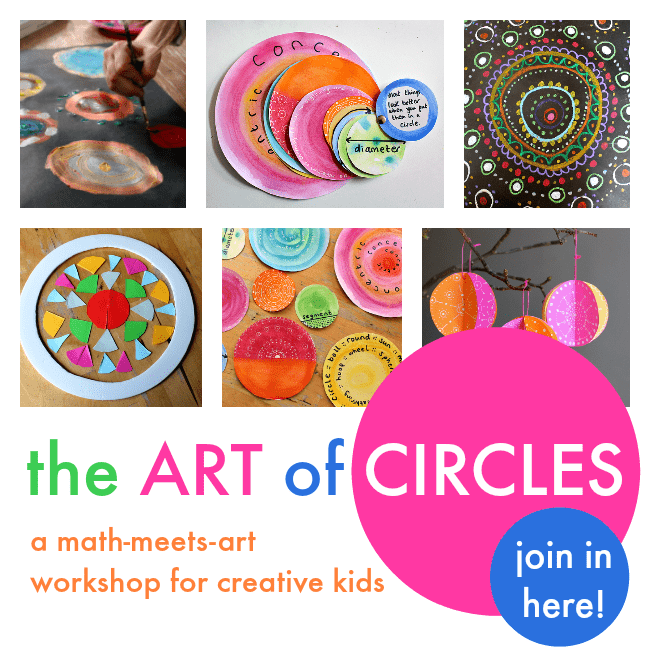 The idea for this maths and art series is inspired by my elder daughter, who is the total visual-spacial-making-creative of the NurtureStore family. She’s so uninspired by all the adding and subtracting and multiplying and (please save her!) dividing. The girl needs some art! Some colour! Some creativity with her maths! So here, to start our series, is a very simple invitation to focus in on just one shape, explore it’s properties and see what you can make with it. 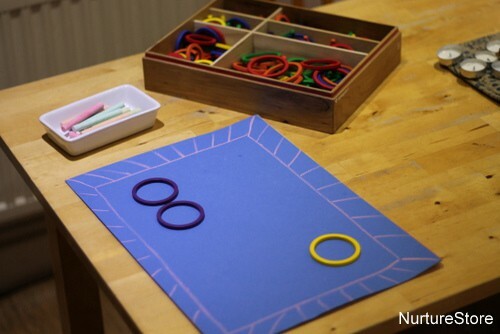 We set out some coloured pieces of paper, some of our Spielgaben wooden rings and some chalk. This kind of maths has no rules, it’s about playing with the shapes. What would you make with them? But one thing I do know is that, even if you’re not aware of it, this is a maths lesson. 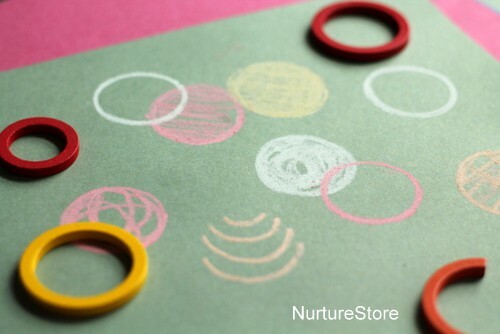 By playing and creating with these circles, your hands, and your eyes, and your brain know more about the properties of circles now than they did before you tried some maths and art. And you can take this knowledge forward with you, into more formal maths lessons, and more creative art projects, and explore them even more. Thank you for your circles idea i will definitely being trying this during my lesson. 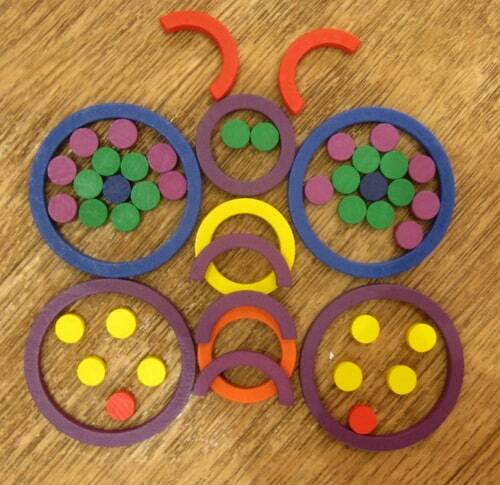 I absolutely love Maths and Art together as a lesson; in my nurturing class we often do shape/art in a creative form. As its coming up to Christmas i thought you might be interested to know that last year and intend to repeat this year because the children loved it so much. We studied David Hockney recreating his drawing and pictures in vibrant colours and then created a Nativity Style picture using triangles, squares, rectangles and half circles continuing the theme of using vibrant colours, then turned them into a calendar. The parents thought theses were wonderful to use all year round. This is a lovely idea, and so much potential. Have you seen the I Spy in Art series? They do a shapes and a numbers version – using famous paintings. I haven’t Culturebaby – thanks for the tip, I’ll check them out. I love to combine the 2 for fresh new ideas. We are doing Kandinsky’s circles..and adding in squares, rectangles, and triangles using the same painting techniques! Why not “kill 2 birds with one stone” and have lots of fun doing it…..learning should be cross curricular! !